The first of five scheduled, free Facebook Festivals takes place this Saturday, May 12, from 1:00 to 6:00 pm in parking lot 14 on the Facebook campus (1 Hacker Way, Menlo Park). The theme is Bay Area Brew and FanFest showcasing professional and collegiate sports along with 22 local youth sports and mentoring organizations, which will benefit from the Festival proceeds. What began in 2015 as 26 weekly farmers markets morphed in 2017 to five monthly festivals. “The markets each had themes, which were clearly popular with attendees,” said Dena Grimm, the Community Events & Engagement Manager for Facebook. “Last year when we made the switch to monthly festivals, the County Fair themed event succeeded beyond our expectations, attracting 42,000 people. The other 2018 themes are: Bayou on the Bayfront (June 9), Summer Jam (August 11), Facebook Fiesta (September 8) and Trucks Yeah! (October 13). 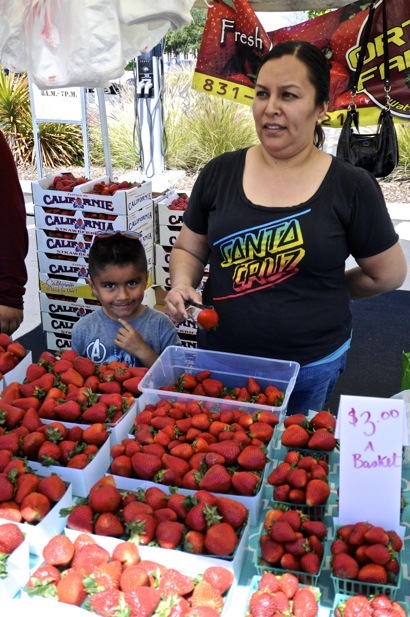 There will continue to be a farmers market component, and new this year, is a free community shuttle serving the adjacent Belle Haven neighorhood of Menlo Park. The schedule is available online. The inaugural 2018 festival will also feature a Battle of the High School Bands on the Festival stage, a family run for charity, Garlic Wars cooking competition as well as a craft beer tasting for charity. “The best thing about being involved with this Facebook festival is the opportunity to help build a sense of community and then engage the community to support the San Francisco 49ers Academy and the work that we do.” said Michele Sharkey, Executive Director of the San Francisco 49ers Academy, which will be a the May 12 festival. Last year’s five festivals were attended by 85,000 people with $92,000 raised for local nonprofits.